We’ve all got pieces of stash fabric that are too good to cut, haven’t we? One of mine is a wool-silk-elastane jersey. It’s a rib knit, so looks the same both sides, but it’s so lightweight you’d think it was a single knit at first glance. The colour is a dark greenish grey. It came from Goldhawk Road some years ago and has been lurking in the stash ever since, waiting for the perfect pattern. 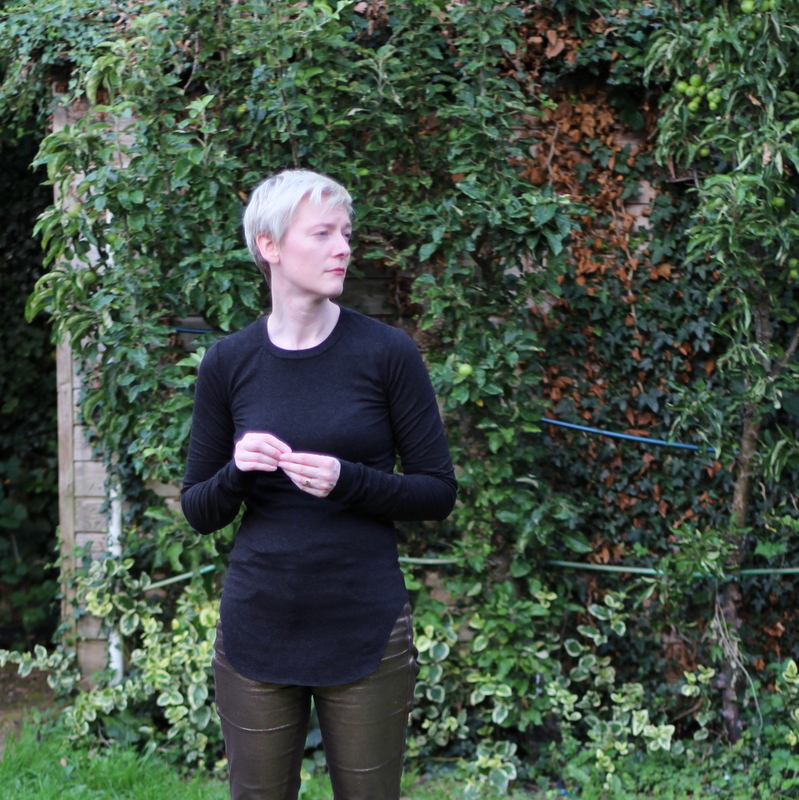 Well right now I’m trying to sew from stash (at least when sewing things for myself), and I need new tops, and I am a great admirer of Rick Owens’ skinny fine-knit jersey t-shirts…so it seemed the time had come to use the special fabric. I like my t-shirts extra long and quite close fitting. For a while I’ve been using a t-shirt pattern I evolved out of McCalls 2401, but recently I’ve been a little unhappy with the fit on it. So for this project I started with the close-fitting jersey block from Metric Pattern Cutting for Women’s Wear by Winifred Aldrich. (This was actually much lazier than it sounds, because I’d drafted the block months ago for another project so it was ready to use.) The basic block seemed a bit boring for the special fabric, so I flipped through my Burda collection looking for interesting details to add. I didn’t have a lot of extra fabric to play with which limited the choice. Eventually I came across 119-01-2013 which has a gathered sleeve that I thought would work well in the fine jersey. I traced Burda’s sleeve and laid it on top of Aldrich’s. Burda’s seemed considerably wider in the wrist but I was fairly confident that the Aldrich block was going to give me the sleeve width I wanted so I narrowed the Burda sleeve. Here’s what I ended up with. What I completely failed to notice was that the wrist end of the sleeve ends up on the crossgrain of the fabric. My fabric is one-way stretch, so the finished t-shirt has no stretch around the wrist at all. That might have been OK if I hadn’t narrowed the sleeve so much, but as it is I can only just get my hands through them. Not good. The final result is wearable but not particularly quick to get on and off. I think the sleeve detail looks quite nice once it’s on. You can see it much better in the picture below. 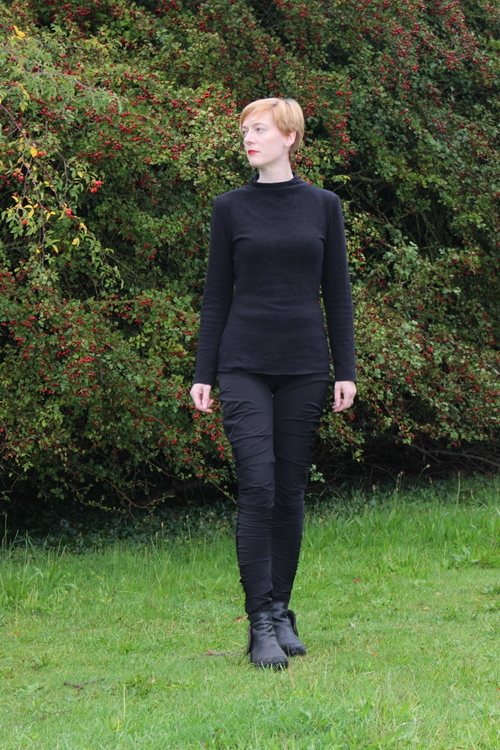 I’ll definitely use this pattern again, but with two-way stretch fabric. I don’t think I did the grey jersey justice with it, but at least I made something out of it that I’ll wear. I’ve just done a muslin for my Liberty fabric dress. The pattern is an attempt to reproduce an elderly and much loved Vivienne Westwood wrap dress that has been sitting in a box for the last few years because I wore it to destruction but can’t bear to chuck it. Here’s the now rather sad-looking original. The most interesting feature aside from the amazing fabric is the collar, which extends into a sort of long flap on the left front that gets tucked through a buttonhole on the right front. Alternatively you can wear the flap loose. The original never looked quite right on me when worn tucked in, but it’s effective on the dressform. Here’s the muslin on me. It needs a few changes, in particular bit of extra width over the hips, but I think I’ve managed to make the collar work! What changed was that I moved the buttonhole down quite a way. 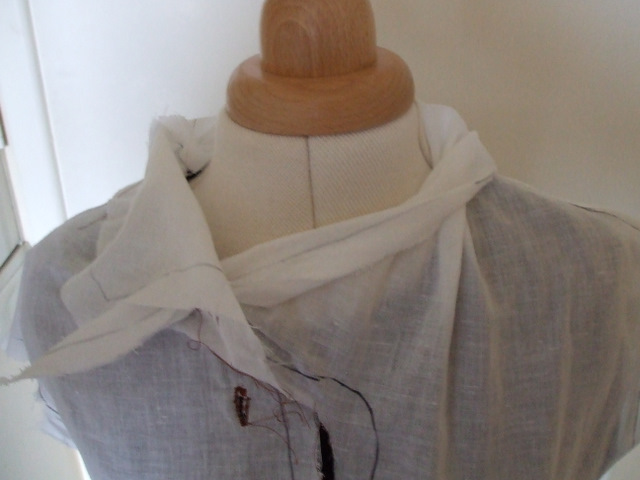 The muslin now has three buttonholes. 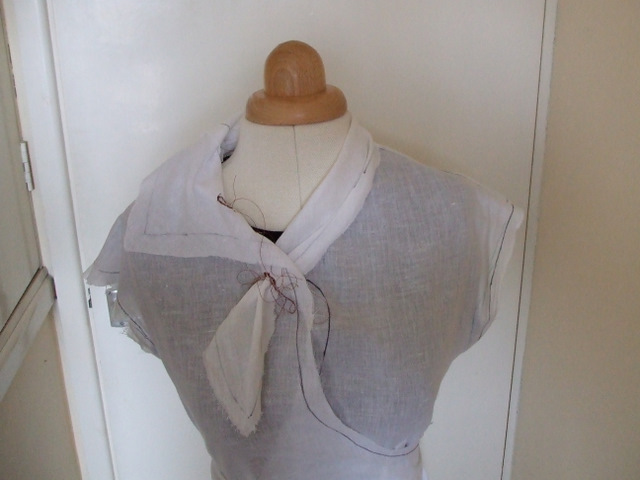 Here’s the collar tucked into the highest one, which corresponds to the one on the original dress. And here it is on the lowest buttonhole, which is the one I shall use. And here’s the collar worn loose. So this is looking quite hopeful so far. Of course I still have to do all the adjustments, draft facings, and work out how to construct the real thing, but I’m very pleased with this for a first effort. Patterns or drafting? Or somewhere in between? I love dressmaking patterns. I have only been sewing for a couple of years but my stash of pattern envelopes and magazines is getting to the point where I can’t easily lift the box it lives in. Despite all this, when I have something very definite in mind that I want to sew I often can’t find a pattern in the box that’s exactly what I want. It’s an empire-line maxi-dress with a surplice-style bodice. There isn’t any bust shaping visible but clearly any real-life version of this dress that’s going to fit is going to need darts or gathers at the bottom of the bodice. I briefly considered trying to draft something but I’m fundamentally lazy and drafting is complicated. I decided to go for the very unscientific method of taking two patterns I have that already fit and munging them together. 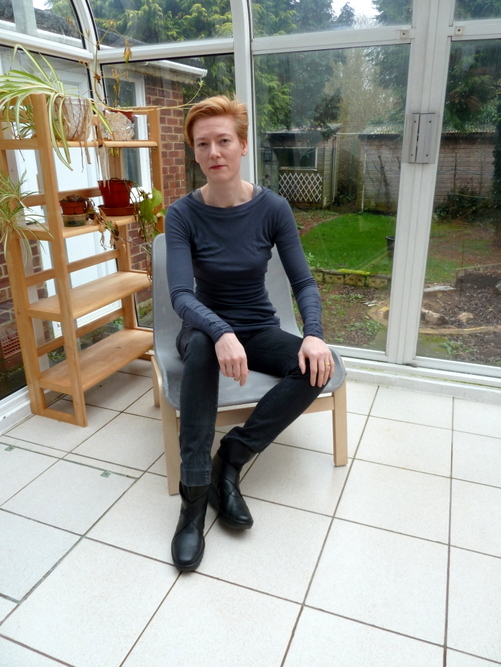 Simplicity 3775 is a modern knit dress with a surplice bodice (sadly now out of print). I’m showing you my version rather than the envelope art, because the envelope manages to make the dress look utterly frumpy, and it’s really not. Simplicity 5349 is a vintage halter-neck maxi dress that I made last year for a bit of a giggle, and have worn and worn and worn. But these two have their problems. The maxi-dress has off-grain centre front and back seams in the skirt, which will look very odd with the regular print on my fabric, and the knit dress is, well, designed for knits. 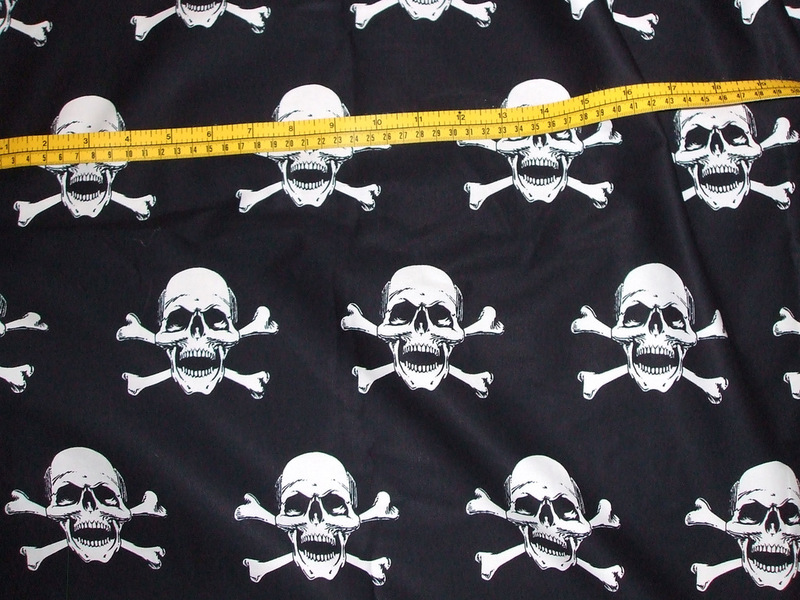 My skull-print fabric is a woven. After much dithering I decided to cut the skirt pieces on the fold, even though it’s going to mess up the grainlines, because the alternative is just going to look strange. 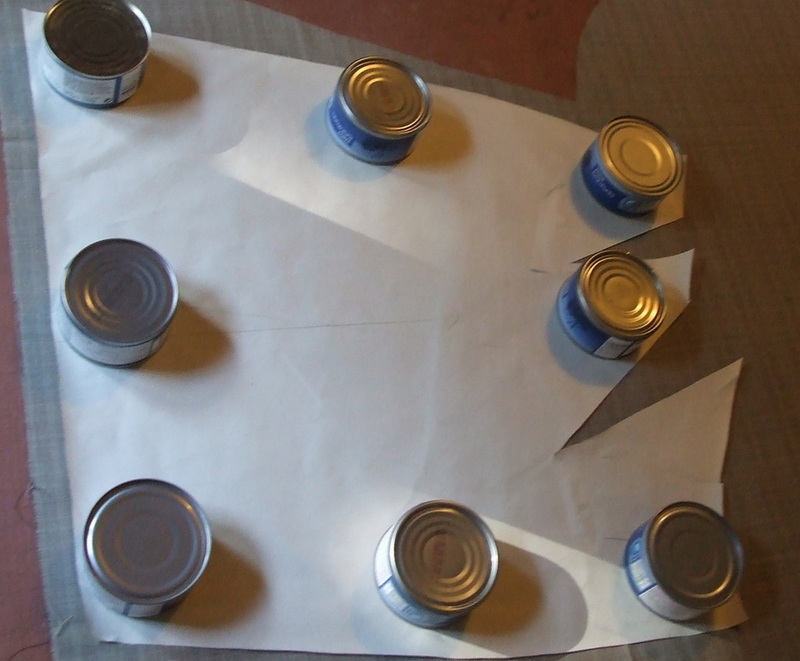 I changed the gathers on the bodice to a couple of darts, then laid the midriff pieces from the first pattern over the top of the skirt pieces for the second and traced round them. I also added some tiny darts to the bodice back to give it a bit of shaping as the knit version has none. And amazingly, my muslin of it seems to have come out looking like a dress. This is the muslin on my dressform. 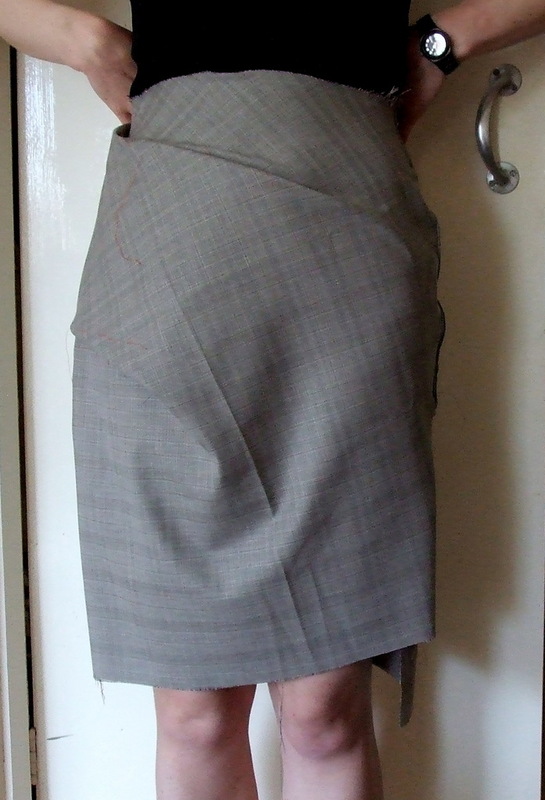 The back has a wrinkle on the left side, but that’s mainly to do with the sloppy way I sewed the zip into the side seam. The funny thing is that I feel much happier tweaking something like this than a Real Pattern. If the pattern is a horrible mashup to start with then the sewing police are not going to come and get me for what I do with it. This may explain why it’s worked somewhat better than some of my attempts at fitting Real Patterns. And it’s too late now anyway because I’ve cut out my real fabric, all four metres of it. I really hope this works out! One of my colleagues drew my attention to a really interesting project called Continuum. The idea is that you go to a website, scribble a drawing of a dress, and a program translates that into a pattern sized to your measurements. 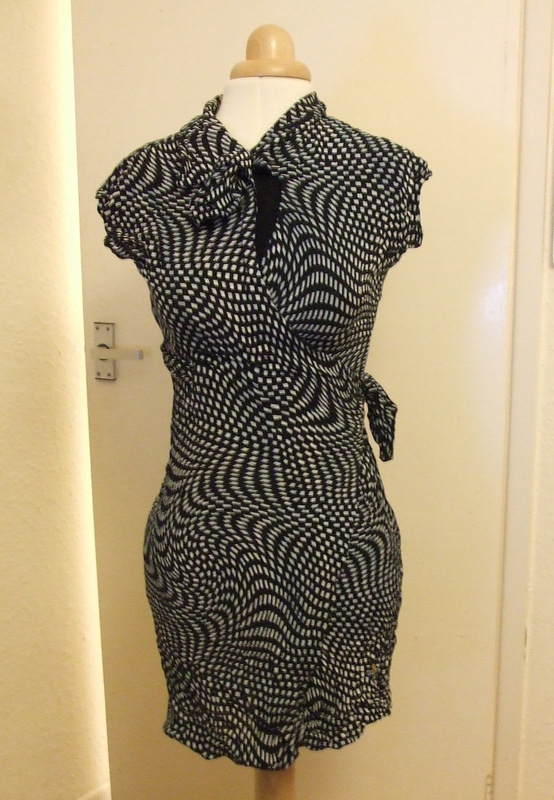 You can then download the pattern and sew the dress. It’s only a demo so far, but you can have a play with it at http://www.continuumfashion.com/Ddress/. Mary Huang, the designer behind it, has made three real dresses from patterns generated by the software. You can see them at her project website here although you’ll need to scroll down a bit. The styles produced are very futuristic and angular because the software works by generating a grid of triangles based on the original sketch. Personally I love that sort of thing and I really hope this becomes more than just a demo. She’s currently trying to raise funding to set up production via Kickstarter. This is a pledge bank arrangement – you can pledge to support a project, usually in exchange for promised rewards, but if the project doesn’t reach its target level of support by its deadline then no money changes hands. One of the possible rewards on this project (for a pledge of $25 or more) is your own Continuum dressmaking pattern! So I’ve signed up, and fingers crossed the project becomes a reality. I should say I have no affiliation with Kickstarter or the Continuum project beyond having signed up – I just think it’s a great idea and wanted to spread the word. A while ago I mentioned wanting to knock off a tartan Yohji Yamamoto dress I saw in Selfridges years ago. I finally bought some fabric for it in Glasgow. But the trouble is that once I started trying to sketch it I found I couldn’t recall very much detail about the style. It definitely had a full skirt and an exposed metal zipper down the front, and I think it had a V-shaped neckline at the front and back. I’ve googled for it but not come up with any pictures I can identify as that particular dress. My mental image of it is starting to morph into the Vivienne Westwood Sunday dress so I may not even be remembering the shape of the skirt correctly, never mind the rest. I’m therefore giving up on trying to reproduce the original and am just going for a full skirted, sleeveless, tartan dress with an exposed zip. 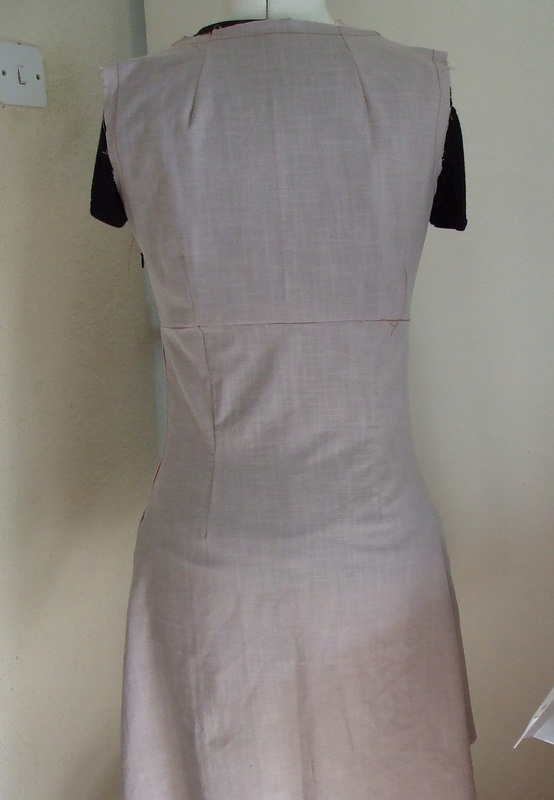 I really like the draped neckline of the Sunday dress so I’m going to put the zip in the back rather than the front. And it looks as though I won’t have to attempt to draft anything, because Vogue have got two patterns that between them do what I want. First is Vogue 8413 which I think has been around for a while. I never really noticed it before because the picture on the envelope didn’t appeal to me. 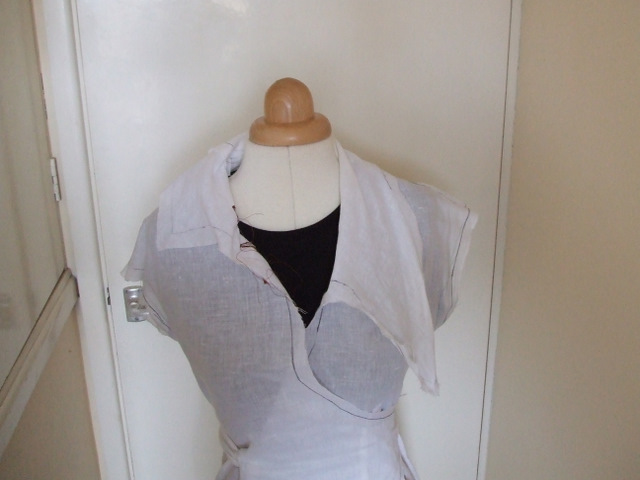 It’s an Easy Options style for wovens which includes a bodice option with a cowl neck. Here’s the line art. Then in the new winter Vogues there’s Vogue 8701, a wardrobe pattern which includes a dress, trousers, skirt, and jacket. The dress is almost exactly the silhouette I’m after although once again I don’t like the envelope picture. Amazing how different something can look in the line art. I’m hoping I can find a way to combine the two styles successfully, although I really want the skirt and bodice back of 8701 with the front of 8413 which might be a challenge! The new Vogues aren’t out in the UK yet so I’ve got some time to think about it. I finished it at last! 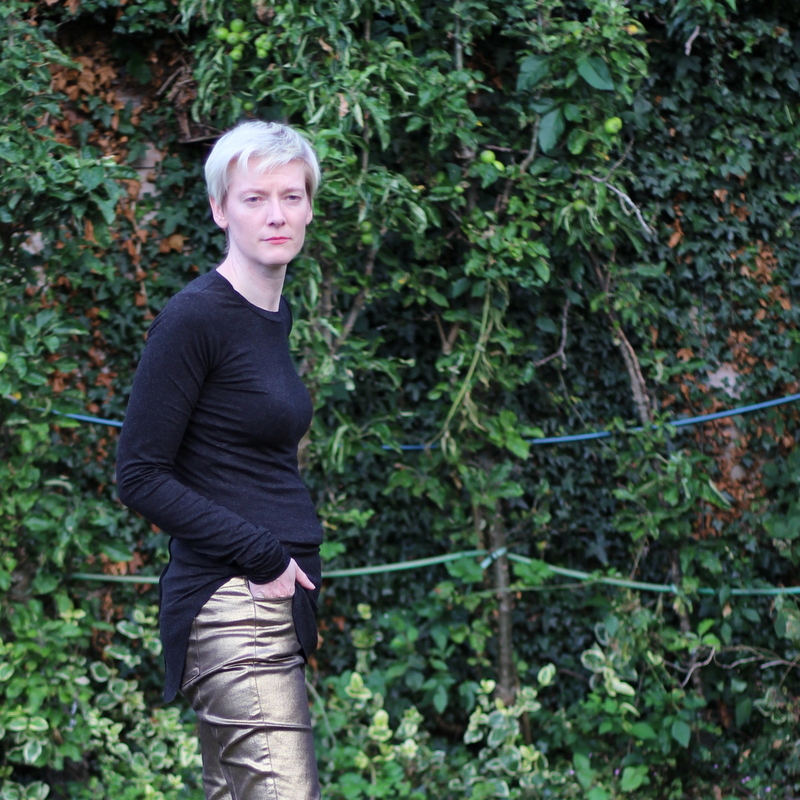 If you’ve not been reading along, this is my attempt to make a version of Vivienne Westwood Anglomania’s Philosophy skirt. I’m really pleased with it. The camera has done something a bit strange to the stripy fabric in the long shots so there’s a sort of moiré effect going on in some of the pictures. It’s better in the closeups. The fabric came from the remnant bin at Remnant Kings in Glasgow. I’m pretty sure it’s wool. It’s certainly warm to wear. The fit isn’t perfect because the waistband came out a bit tight. This is because I drafted the skirt to end at my natural waist, and checked the fit at the waist, and then added a waistband of the same width on top of that. Oops. Next time I’ll know better. I used hooks and eyes for the closure of the waistband so I just sewed them on a bit further out to give me some breathing room. 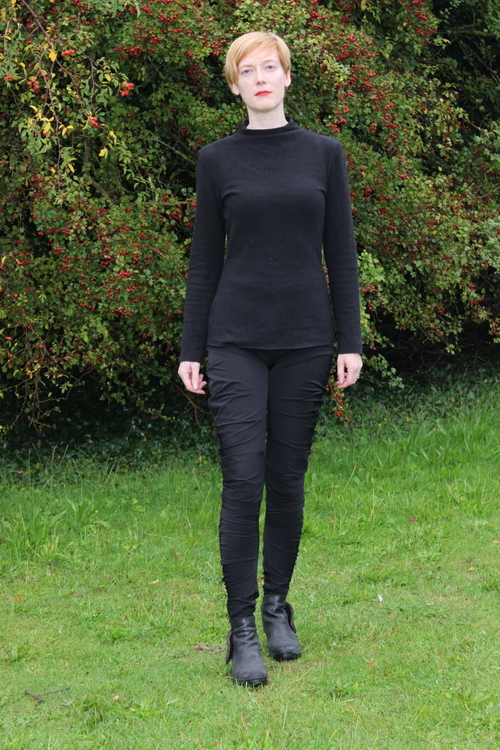 I tried adding an inseam pocket to the design but it really didn’t work. It had to go on the side with the pleats because the other side has the zip. The side seam went all wonky with the pocket in place so I ripped it out. It’s quite hard to unpick seams in this fabric because stitches just vanish into it, but once you’ve managed to remove them it doesn’t leave a mark. I like it with the plain black T-shirt (Marks and Spencer‘s finest). I’m not sure about shoes. The blue ones are nice but I couldn’t resist trying it out with my Vivienne Westwood platforms. Unfortunately they aren’t very practical. In fact I can only just walk in them, but they’re good for posing! I made a lining by cutting it out from my original tailored skirt draft. This is a regular skirt block with darts for shaping. I made the draped pattern by cutting up a copy of the block, so in theory the lining ought to be the same shape as the skirt once I’d sewn the pleats and darts. I could have used the same pattern pieces for the lining as the fashion fabric but I had visions of catching a toe in the pleats while putting it on. Amazingly this did work. I wasn’t sure what the correct way to finish the lining hem would be. I definitely didn’t want it hanging free at the hem as it would be bound to show at some point given that the skirt hem isn’t straight. I originally considered using my lining fabric as underlining, but couldn’t bear the thought of itchy woolly seam allowances so the skirt had to have a proper lining. In the end I attached the lining in the usual way and stitched in the ditch at the side seams to fix the lining to the fashion fabric near the hem. That allowed me to treat it like an underlining when hemming and sew the fashion fabric to it. This project has been a really educational experience. I’d like to try drafting some more things now, although I’ve got a couple of projects from patterns ready to go now. Next up is a BurdaStyle skirt, if my fabric survives the bin-liner-and-wet-sheet preshrinking method. I’ll let you know on Sunday! No pictures yet, but my skirt project is coming on steadily. It’s a knockoff of a Vivienne Westwood design which has a drape on the front made by two roughly horizontal unpressed pleats. I’ll post pictures when it’s done, but in the meantime here’s a quick list of things I’ve discovered during the process. It’s a lot easier to put in an invisible zip if you interface the edges of the fabric first. My zip’s in a curved side seam and in the muslin it went a bit bubbly. I fused Vilene bias tape down both sides before inserting the zipper in the real thing and it went in very evenly. Point turners are better than pencils. I usually use a blunt pencil for turning out corners, but recently picked up a proper point turner. I got pretty good corners on my waistband with its assistance. The end of a 60-30 set square might have the same effect although it would be harder to fit in the sewing basket. 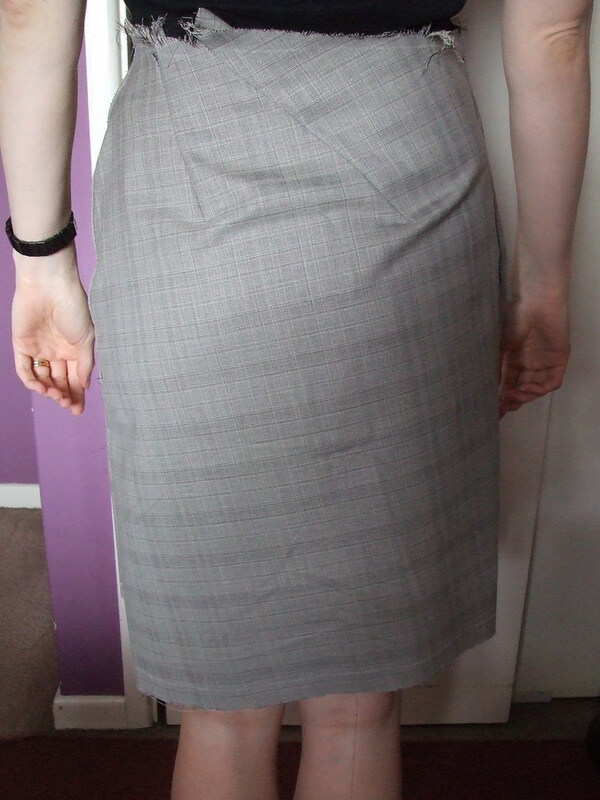 Muslin the waistband as well as the rest of the skirt…mine turned out a bit tight! Too late now but I’ll know for next time. Woven stripes make fitting a lot easier. Probably obvious but I’d never tried it before. You can see every little distortion and bump very easily. Those chalk wheel things are brilliant. If you’ve not seen one, they’re a triangular plastic device with a little plastic wheel in one corner and a container of powered chalk in the opposite edge that coats the wheel as you run it along your fabric. They make a really fine accurate line, but the real win is that it means I don’t have to sharpen the chalk every five minutes. And in other news, many thanks to Alice for coming up with a fix for my meh dress! The lining isn’t sewn to the waist seam so it should be possible to scoop out a bit of the front bodice seams and reduce the bagginess. That’s next after the skirt. As my last project turned out to be a big disappointment I couldn’t wait to get started on something new. I’m going to try to make a version of a Vivienne Westwood skirt. The style is called Philosophy. I originally saw it while browsing in the Vivienne Westwood shop in Glasgow. There are some good pictures on Net-a-Porter. It comes in a few different fabrics. It’s basically a pencil skirt. There’s a drape at the front which is made by a pair of pleats that are caught in the right side seam. On the back of the skirt all the shaping comes from two darts, both on the left, which slant towards the right. There’s a zip in the left side seam and a narrow waistband. 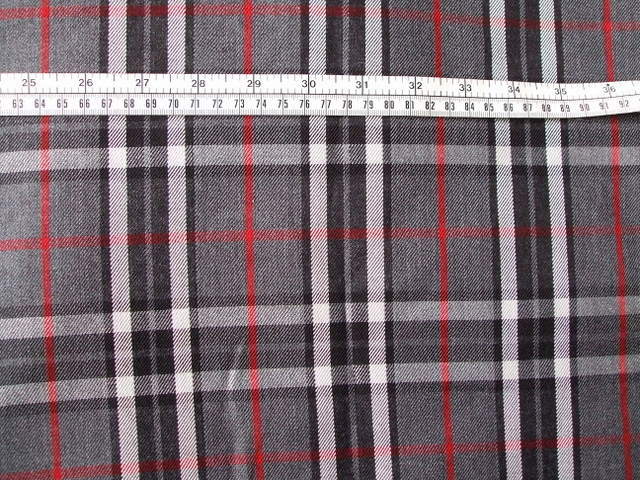 The hem is on a slant at the front and back and so the length doesn’t match up at the side seams. 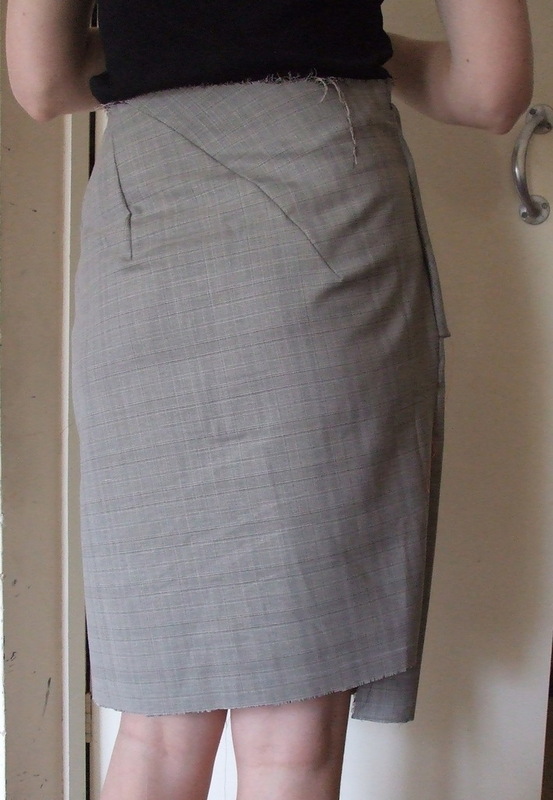 My starting point was to draft a basic pencil skirt block to my measurements. 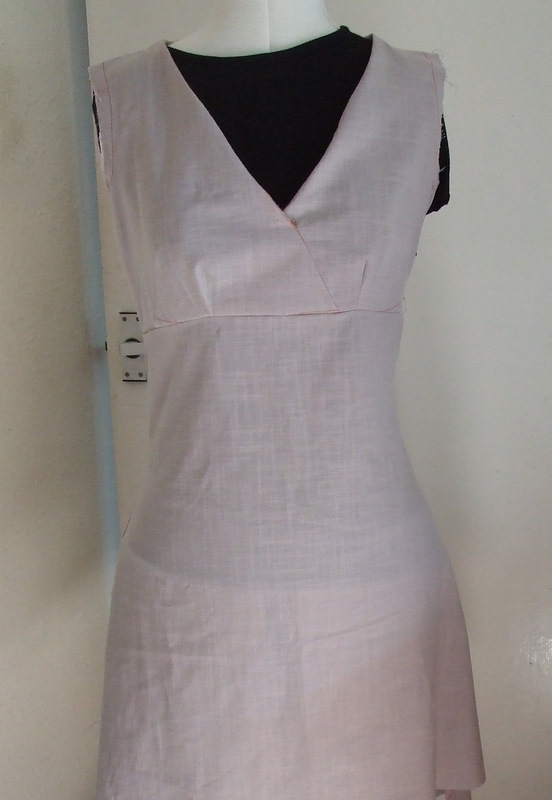 I used Metric Pattern Cutting for Women’s Wear by Winifred Aldrich. 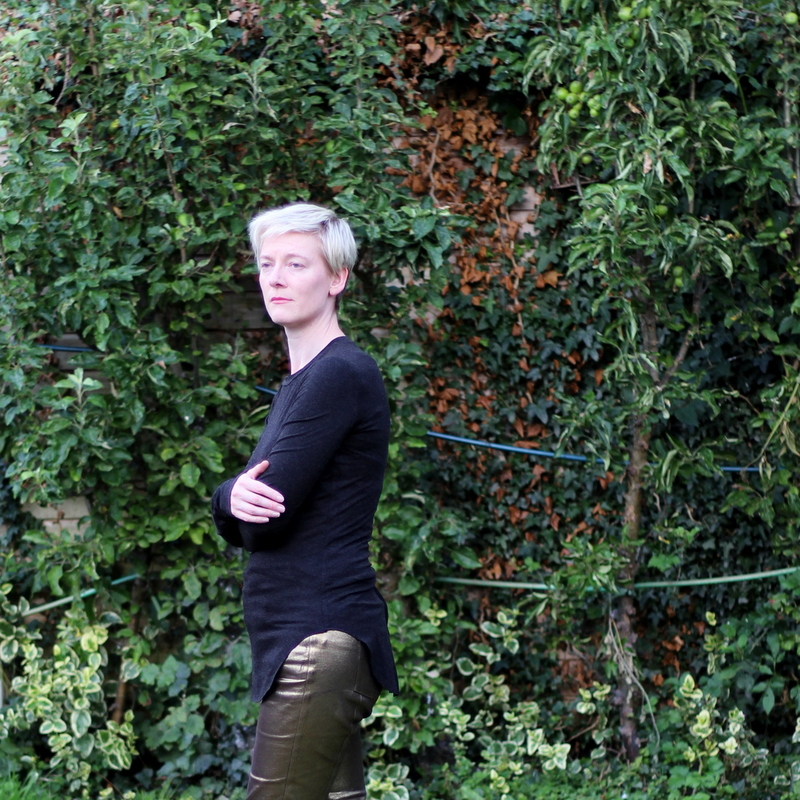 I measured myself (that was a nasty surprise…I blame the Glasgow restaurants) and started following the book’s drafting instructions for a tailored skirt block. I immediately hit a problem because the book would have you use a fixed measurement for the length between your waist and hip which you read off from a table based on your pattern size, ie your bust size. I really don’t see how this can produce a correctly fitting skirt on a person who isn’t averagely proportioned. 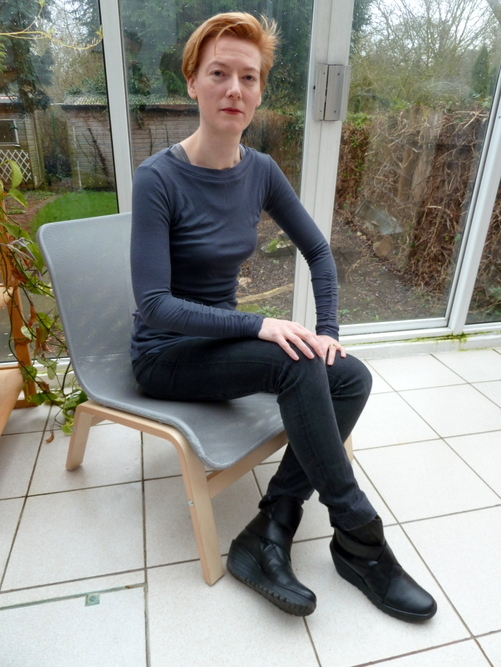 I’m pretty tall and my waist-hip length is 20% longer than the one in the table. In the end I just used my own measurement at the appropriate point rather than the one from the table. Much crumpled paper later I had a very plain pencil skirt block which looked far too big. I carried on regardless. The next part was a lot more fun. I cut the block into pieces along the existing dart lines and the lines where I wanted the new darts and pleats to be, and moved the pieces to close up the old darts and make gaps where the new ones are. 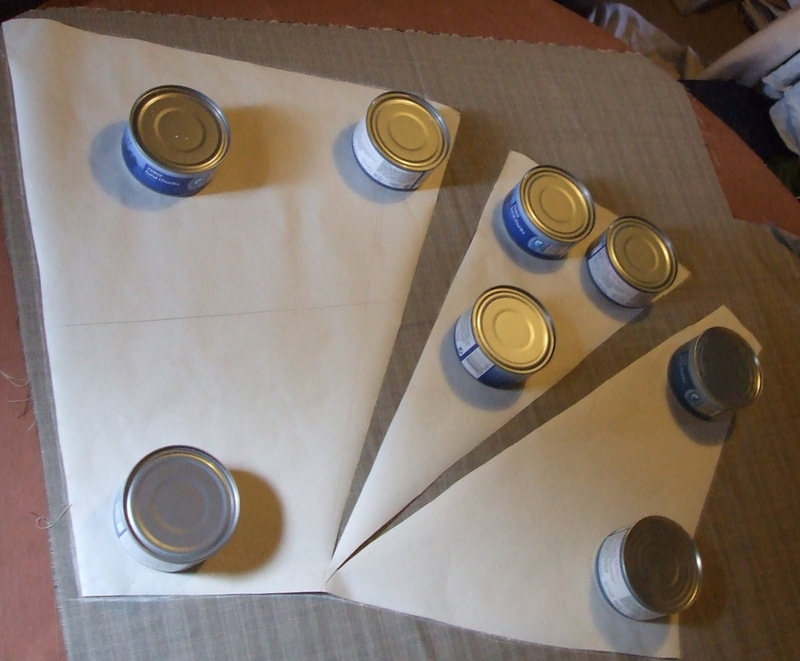 I wanted the pleats to be extra deep so I spread those out further by cutting all the way to the opposite side. I have no idea how you’re supposed to draft this stuff properly; I just made this up as I went along with a bit of inspiration from Make Your Own Dress Patterns. From the pictures of the original made up in stripes it was obvious that the hem’s on the straight grain so no head-scratching about where to draw the grain line! Here’s what it looked like at this point. 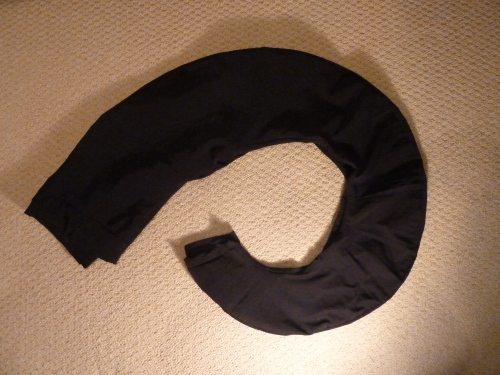 I cut it out, adding approximate seam allowances, and sewed it up. It was a bit too big on the waist and tight on the hips so I altered those, but on the whole the fit was surprisingly good. The front shaping came out right straight away but there was a funny wrinkle at the back. I also should have pressed out that crease in the fabric before taking pictures…never mind. Lengthening the darts and taking the waist in a little improved the wrinkling. It’s still not perfect but I think it’s good enough to go now, so at that point I ran around the seam lines with a black marker and took the muslin to pieces to use as a pattern. 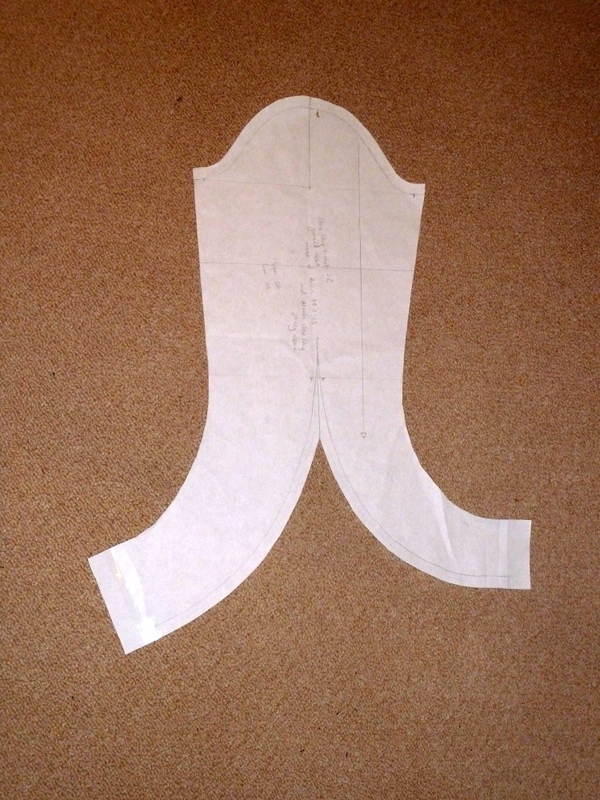 I drafted a waistband by the unscientific method of tracing the waistline of the muslin and adding width to that curve. Now I just have to work out how to line it.